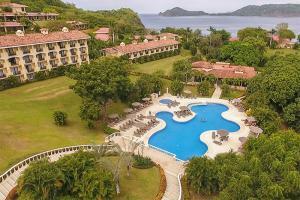 Occidental Papagayo is a fantastic adults-only, all-inclusive experience in the Gulf of Papagayo on the stunning west coast of Costa Rica. Guests can enjoy both the comfort of this intimate resort and the exotic fauna in the vicinity. The resort features spacious and bright rooms, designed for your comfort. Experience the best of Guanacaste and Culebra Bay with activities such as diving, cycling, guided tours, kayaking and more. Relax and reinvigorating yourself with a dip in the beautiful pool or a stroll through the beautiful gardens. The resort provides magnificent culinary offerings including two international à la carte restaurants and a buffet with international food, as well as a snack bar and lobby bar with excellent views. 800 meters north of Playa Hermosa boulevard, Guanacaste. Only 25 minutes from Daniel Douber Airport. Canopy tours, eco-tours, fishing, snorkeling, diving.